It’s a long-standing tradition among military, police, firefighters and other close-knit groups to design a commemorative coin. The coins are distributed as a way of saying thanks, or of showing respect. Jonathan Grave designed one for his team at Security Solutions. As you can see, one side features the company’s logo, and the other features the faceless heroes who have allowed Jonathan to stay alive as long as he has. The inscription—”On the Side of the Angels”—says it all. 1. Coin-for-coin trade. You know who you are. You’ve got your own unit coin, or coins that you have collected from others. Email digger@jonathangrave.com, and we’ll trade addresses. Your coin for my coin. 2. 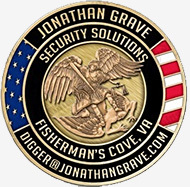 For a $20 donation to the SEAL Legacy Foundation you will receive a Jonathan Grave Challenge Coin. You will be supporting the heroes that fight for our safety on a daily basis. Click here to make a donation.